Artwork I created as part of this experience with a powerful message–there is no such thing as “away”. Humans, especially in indigenous cultures, lived within this system, being part of this system. Perhaps some stone tools and burial mounds remain to mark their passing, but they had small ecological footprints. Fast forward to modern-day America. Most of what we use does not come from the larger landscape without a substantial cost due to the amounts of chemical processing such “stuff” undergoes, and most of what we throw “away” does not cycle back into that landscape easily. We make mountains of it, literally, rising up out of the earth. Those mountains are disconnected from the natural system, they lock up the resources along with chemicals and a bunch of stuff that is harmful if it returned to that system (consider, for example, toxic sludge). I didn’t realize that when I began the worm bin project, I’d see the same thing at work in my worm bin. Worm bin ready to harvest! As I sifted through handful, I found my first piece of plastic. Unaltered, unchanged, just a bit dirty. 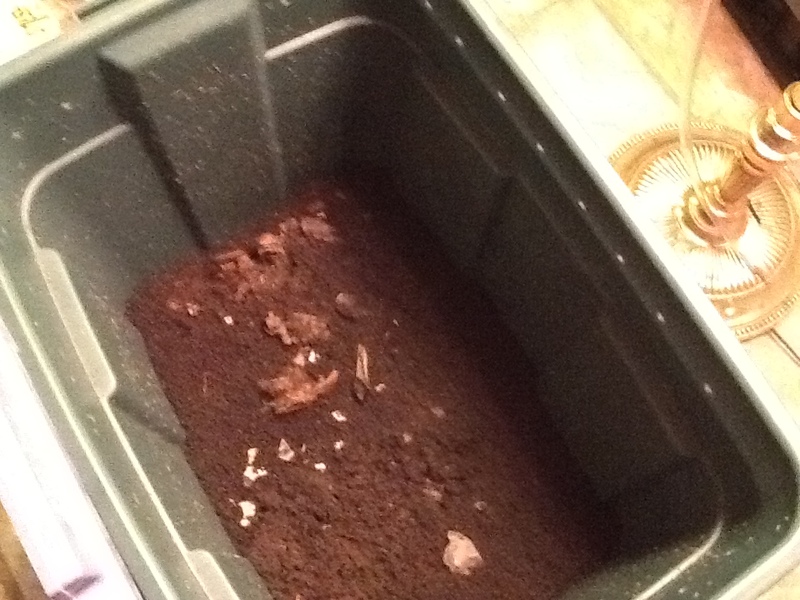 I monitored everything I put into that bin–and tried hard to only give the worms what they could digest. But the plastics had slipped their way in. I stared at that plastic, about 2″ long, white, and crinkled. I though about the worms’ inability to digest it, to do anything with it but let it sit in the bin and work around it. I wonder if they tried to eat it? I wonder what it tasted like? 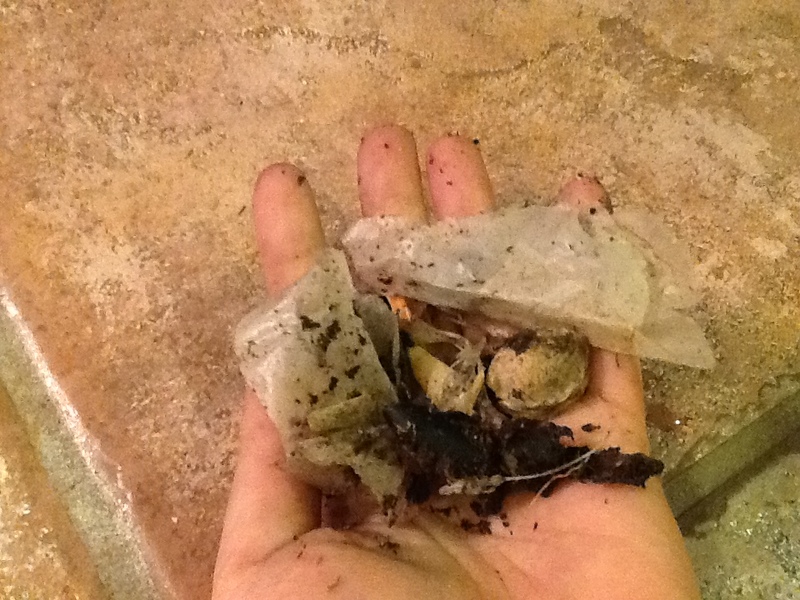 As I stared long and hard at that plastic in my hand, covered by worm castings, the ramifications of knowledge I learned while still in childhood hit me–2000+ years for that piece of plastic to decompose, if not longer. I put it aside, and continued the work of harvesting worm castings and putting my red wriggler worms back into their bin. As I continued to sift my worms out of the compost, I found more and more plastic–the coating from a label I missed on a banana, a twist tie, a small tag once included a stem of a vegetable. 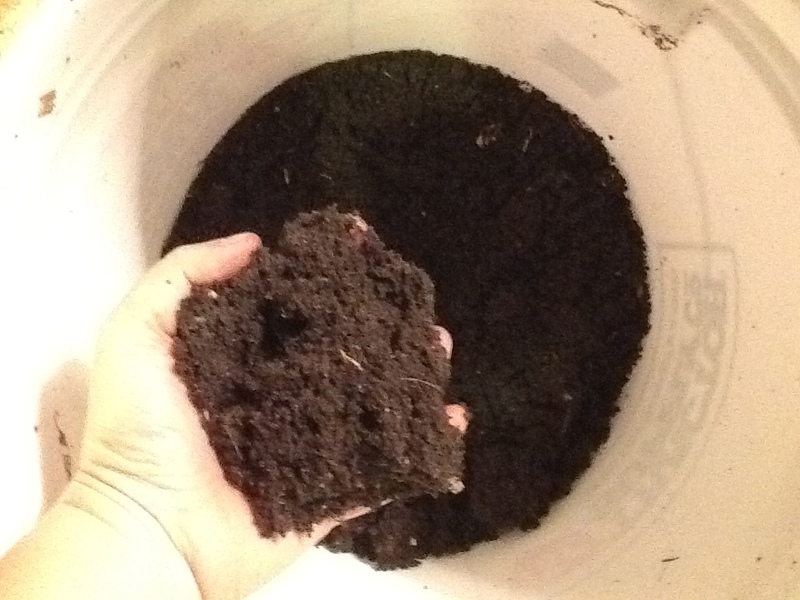 I thought about how my worm bin was a microcosm, and that worms and other bacteria everywhere are engaging in the same cycling of nutrients all around this planet, and the plastics that get in the way. It was a powerful moment, there in my den. We all know about how plastic doesn’t break down, how we over-use it, and over-produce it. How everything comes in plastic, how we routinely throw away plastic that can’t be recycled. With each time we do that, that plastic goes somewhere–there is NO such thing as AWAY. 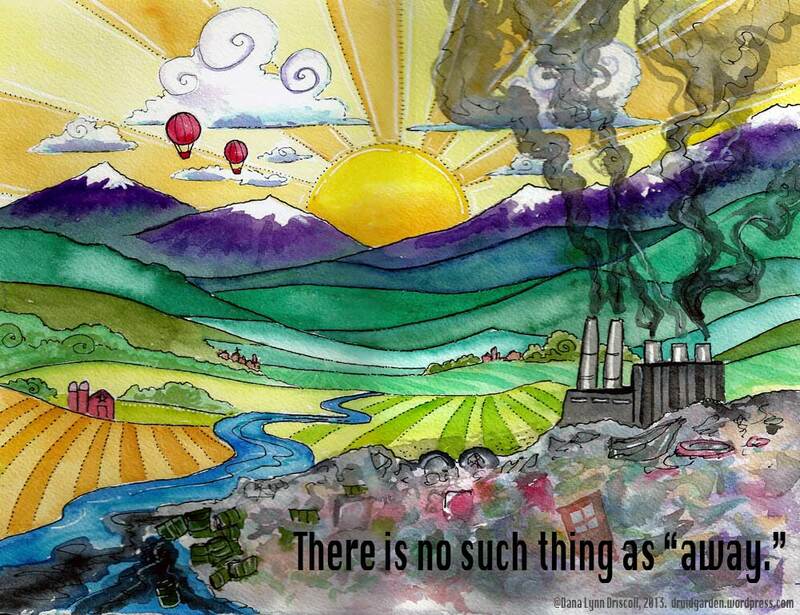 How plastic sits in our landfills, washes up in our waterways, ends up in our foods and bodies. And yet we treat it so carelessly, throw it away, and never think about it again.It doesn’t just go “away.” Where does it go, you ask? All plastic found in my worm bin! There are literally beaches of plastic, islands of plastic, all washing ashore. This video is worth the watch–it puts a very real face on the challenges we face, as a civilization, with plastic (and this, itself, is a microcosm of larger challenges we face). This whole experience has made me, once again, re-think my relationship to the natural world. How can I, ethically, purchase foods with plastic? How can I throw any plastic “away” (even that which cannot be recycled) if it doesn’t return to nature? Now that I’ve had a first-hand look at this within the microcosm of my worm bin, I think my next great task is to find ways to eliminate excess plastic consumption from my life, to use what’s already in my life to its best and fullest, and to teach others to do the same. In response to this experience, I also painted the piece that you saw at the beginning of this blog post. Its a powerful reminder that we are not disconnected from that cycle, but part of it. Everything we do is part of that cycle, whether or not we want to realize it. I think sometimes we believe these things, internally, but so much of our culture has taught us to think the opposite, that our actions still reflect that culture rather than those internal beliefs. I’m constantly finding myself in the “consumptive throw away mode” without even realizing that I’m there–and this experience was a powerful reminder of the need to continue to move out of that mode for good and find better ways of living and interacting with the world. Brie, Thanks for the comment! I should get some of those “There is no such thing as away” pieces printed up, huh? Good idea :). I don’t have a worm bin yet, but it is on my list. 🙂 Interesting about the whole ‘there’s no such thing as away’. It is totally true. I recycle as much as I can of the plastics we use, but even so an amount goes into my bin that I am not happy about. There was a big push here in the UK to stop shops giving away one use plastic bags, but instead they just charge a few pence for them, and I despair at the number of people I see shopping in the local shops around here that say yes when asked if they want (and they do say ‘want’ at the Co-op, although they say ‘Do you NEED a bag at Waitrose) a carrier bag, and they put their single item into it and walk out of the shop. Evidently, having to pay for the bag is not a sufficient deterrent. I’ve started writing companies about their bad plastic packaging (this is especially true of companies that are promoting “green” products and packaging them in a ton of plastic. Ugh). They sometimes even respond!